Today we thank God for the gift of death. Does one generally look upon death as a gift or is it more feared and never discussed? Just as life is gift, so also is death. Because life is precious one tends to cling to it. Death on the other hand is seldom embraced. Recently I was present when a family member died. It was my first experience of seeing someone die. Death was not something I never discussed it is always a part of my life and something I speak about. My dear dad spent his life teaching me but his greatest lesson in life was the way he embraced his death. Perhaps it was wisdom that quietly comes with age or maybe it was his way but whatever it was dad grasped the onset of death with all he had. Whatever was thrown at him he took with gratitude. 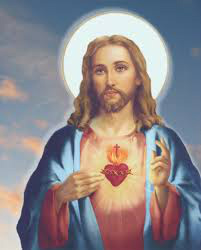 The doctors and nurses were amazed at this man as his suffering was great and there was never a moan or a cross word instead all he would say were words of gratitude, mostly thank you. Dad's speach had almost gone and yet he managed a thank you for everyone. He knew death was approaching but still filled us with peace and joy. The more pain and suffering that he endured the more his gratitude increased. He trusted the team of medical experts who were taking care of him and if he did not want something he would signal it to them. In dad's last few days one could slowly see life ebbing away little by little until the final hour when it was one breath, then another and another until there was no more. Life just gently slipped away and dad had breathed forth his soul in peace back to God. It was not the end but simply the beginning of a new life in a different place. So why do we fear death so much and not just simply embrace it. Some of the great saints stress the importance of always keeping our death before us in our minds and being prepared for it spiritually. So today let us give honour and glory to God the father for giving us the chance to die so as to be born to a new life with him. Today let us thank God for the gift of the sea, the water that surrounds our world, that gives life to so many creatures, work to fishermen, peace and joy to so many people. 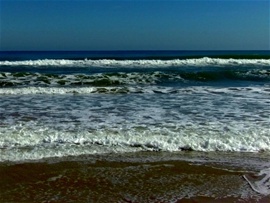 I love the vastness of the ocean, It is a place where our souls can find much rest. The rhythm of the sea has the power to soothe and calm a soul. It also can be a very dangerous place if a healthy respect for it is not observed. Everytime I gaze upon the sea whether calm or rough I am reminded or the wonder and splendour of God our Creator. What man could create such power and beauty? Only God can. One summer I had the oportunity to swim in the deep blue sea. I had never done so before, I usually swim near the waters edge. As I was not used to deep sea swimming I was very careful. The waves crashed against the rocks and entry had to be timed very carefully. I made it into the water and began to swim only to find that I was against the tide and was getting no where fast. If I kept swimming I would only run out of energy and probably drown so I decided to lie still on the top of the water and float like a piece of drift wood allowing the sea to carry me out. It was the most beautiful feeling, I soon became one with the sea. The deep blue sea caressed and embraced me and I felt really safe. I had let go of all fear and allowed the sea to be master. When I was out far enough I stopped floating and began to swim back to the rocks as I was swimming with the tide and not against it on the way back. The point of telling this story is that the sea can lead us to thoughts of God. God who is all powerful who is master of all can gently caress us and take us to where we want to go without effort on our part. All we have to do is to trust Him who is all powerful, rest in God's presence and allow Him to do the work. He will take us to where we need to be. Today let us be grateful to God for the beauty and splendour he provides us with in His gift of nature. Let us give praise and thanks to Him for it all. Today let us give thanks to God the Father for the gift of Himself to us. Usually we think in terms of God giving us His only Son, Jesus Christ but He has also given Himself to us in the role of our Father. God who is the Creator and maker of all things is also Our Divine Father our only Father. 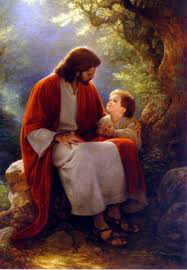 Though we have earthly dads we have only one real Father who is in Heaven. "And do not call anyone on earth 'father,' for you have one Father, and he is in heaven." 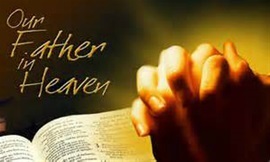 In the Lord's Prayer, the Our Father, the very first line spoken by Jesus Christ confirms also that God truly is Our Father in Heaven. When we think of a Father figure, he is someone who loves us and protects us from harm, someone who provides for our needs and wills only good for us. So too it is with God in Heaven. How precious we are in our Father's eyes and how much he loves us, if only we could grasp this truth we would live and die in happiness. Today let us bring glory to God our Father in Heaven by acknowledging Him as Father, by thanking Him for all his mighty goodness and love and by allowing Him to walk with us on our earthly journey to Him in Heaven. Let our lips only bring praise and honour to Him and let our hearts be melted by Him who is our God. Today let us thank God for the gift of Himself in Eucharistic Adoration. Some people might say why sit in a room with a little white Host? That is not what Eucharistic Adoration is about. 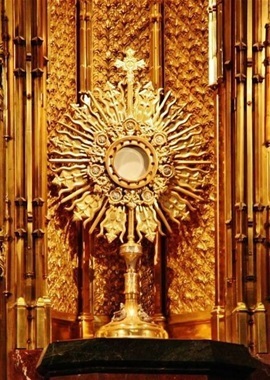 Jesus Himself is truly present in the monstrance. Each time we come to adore Jesus in Eucharistic Adoration He is there with us as a friend. He listens to us and when we let him, He speaks to our hearts. Jesus is our true comfort our true solace. He is the delight of our souls and restores balance to our broken lives. In the silence and stillness of the Adoration Chapel we can switch off to the world outside. We come to spend time with the One who truly loves us, who sacrificed all for us. I sit with my best friend and I am myself in front of Him, warts and all. There is no judgement, no harshness of words, nothing but peace, joy and love. Now who does not want all of these things. We all crave peace in a world that is torn apart with wars and frictions. We all seek joy that is not lasting in earthly things and again we all seek love but do not experience true love until we have met the person of Christ in our hearts and souls. Eucharistic Adoration, is a place where Jesus makes Himself readily available to us every moment of the day. He invites us to drop in from time to time to visit Him and to spend a little time with him. Let us bring Glory to God by acknowledging that Jesus is truly present in Eucharistic Adoration and by spending time with our Best Friend, Jesus Christ. Today let us thank God for the gift of the Eucharist, Holy Mass. These are the words spoken by Jesus Christ Himself at the last supper when he instituted the Eucharist. What is the mass, and how do I relate to it. The Mass is a commeration of the Last Supper. It is a remembrance of the sacrifice Jesus made on our behalf. So often we attend mass and our hearts and minds are far removed from where we are. This is because we have not understood who is present on the altar and what is actually happening. The celebration of the Eucharist has many parts to it. There is the table of the Word and the table of the Eucharist. Before any of this takes place we tell God we are sorry for having offended Him in our daily lives. The table of the word is where we listen to God speak to us through His word in the readings, psalm and Gospel and also he speaks to us through the words of the priest in His homily. Like visiting a friend if we do not listen as they speak instead we pick up a book to read or turn away to something else we offend our friend. It is the same with Jesus Christ. He desires that we listen to what he wants to say to us. The table of the Eucharist, is the part of the mass where the bread and wine are transformed into the body and blood of Christ. Jesus, without ceasing to be in heaven, becomes really but visibly present. He renews what he did at his crucifixion; he prays the same way he did on the cross. He is not confined by time and space. A miracle takes place at holy mass. Jesus gives of Himself to us in Holy Communion. We come, to Him, we listen to Him and we take and eat His body and we have union with Him. We come to a sacred place, we witness a miracle being performed by Jesus Himself through the hands of the Priest and we are invited to have union with God. It does not get any better than this. All the heavenly host of angels and saints are truly present on the altar. It is a celebration where heaven touches earth and we are privledged to be a part of it. This is the most wonderful gift that God has given to us and so few really grasp what it is. Some people look at the gift but never open it to see what is inside. How sad for them and how sad for God. If you feel you are like I once was "a bum in a seat", physically present and nothing else, then pray to God, ask Him to teach you how to pray the mass, how to understand it and to be fully present at it. He will hear and answer your prayer. So today let us bring glory to God by firstly seeking a desire to go to mass and secondly to be fully present and attentive to what is going on. Let us go and see, have union with God and then union with one another so that we become one body in Christ and bring Glory and Honour to God. Today we thank God for the gift of His Word in Sacred Scripture. God speaks to us through His Words written in the Holy Bible. Each time we attend Mass the Word of God is proclaimed. If we are attentive and have ears to listen our hearts can be set on fire and our lives changed for the better. God's Word can teach us, it shows us how much God loves us and how much He desires to communicate with us. In the Gospel of today Mt 6:24-34, Jesus teaches us that right balance in life is needed. Jesus uses the birds of the air to teach us about freedom. The birds of the air do not worry about food or clothes, they are free from care and worry and exist only for God, to sing His praises. Jesus teaches us that life existed before clothes and the body before food. Both life and the body are given to us by God and so have immense value that food and clothes do not have. Birds are free to fly but we are bogged down with worry and things. Jesus calls us to set our hearts on love and justice and not to worry about tomorrow as we have only to live in the moment. Jesus tells us to look after what the day brings that is enough nothing more is required. This is only one small passage that Jesus has given to us and look at what it teaches us. How much more can we learn if we take to heart the Word of God. Today let us give glory to God by reading, reflecting and listening to what He has to say in His holy Word and then by living it. Today let us give thanks to God for the gift of resurrection. 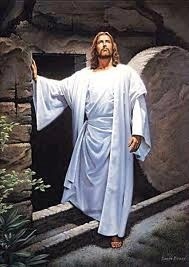 Through Christ's death and resurrection, we are given eternal life, we are given the gift of resurrection. Each Easter season we celebrate the resurrection of Christ. Jesus Christ the Son of God the Father in heaven came down to earth, suffered and died and on the third day He rose from the dead. We read all about it in Sacred Scripture and we hear it preached in Church but do we really grasp the reality of it all or is it the same routine every Easter Sunday just going through the motions and not really understanding the gift? Christ's resurrection is a freedom from slavery, the chains that bind are now broken and God's mercy flows abundantly to those open to it. Resurrection is a time of holy joy, a time of real celebration a time where Christian hearts melt in the joy of the Risen Lord. Nothing should take from this Easter joy, it is ours to claim, Christ has earned it for us and God wills us to have it. In this Easter Season let us bring honour and glory to God by truly believing in the Resurrection of His Son Jesus Christ with all our hearts and by living in holy joy, delighting in our God, living in peace, gentleness, patience and love. Today we thank God for the gift of gratitude. Everything we have is God's gift to us. Gratitude is a gift that results from love. Where there is love there will be gratitude. Where love is not perfect and there is fear gratitude will not be possible. Jesus Christ is the perfect example of gratitude. There are lost of accounts in Sacred Scripture where Jesus gives thanks to God the Father in Heaven. Jesus knew the love of God the Father and it was this love that caused Him to live in a state of gratitude. Our Blessed Lady also knew the love of God the Trinity and she also lived in a spirit of gratitude. Her soul glorified the Lord. It is nice to hear someone say thanks for a gift, a kind word, a helping hand etc... Think how Jesus must have felt when only one of ten came back to say thanks after being healed. This blessed day let us bring glory to God by thanking Him for His wonderful gift of life and love to us. It is not possible to thank God properly for all He has done and continues to do for us but let us not insult him by ignoring Him. Let us show Him our gratitude by spending time with Him, by listening to his whispers and by being his friend. Today we thank God for the gift of mothers. When God created us he gaves us a mother who would look after our earthly needs, whether natural or adopted we were given a woman to nurture and care for us while on this earth. Today we celebrate all the hard work that mothers around the world have done for their children. We ask God to bless them and protect them. May he fill them with His peace and joy this day and may all children learn respect and gratitude to God for their mothers. We also thank God for Our Blessed Lady, our spiritual mother who looks after all our spiritual needs. Mary, constantly interceeds on our behalf with her Son, Jesus Christ, she guides us and leads us to Him. How blessed and loved we are by God that he should give us two wonderful mothers. This day let us give glory to God by taking a few quiet moments to kneel and pray with hearts of gratitude for our mothers and His great love. Today we thank God for the gift of "Rejection". You might think how can rejection be a gift? To understand rejection as gift let us look at this Sunday's Gospel. It is a parable about a blind man who was blind most of his life. He sat in the street begging for his keep, he was shuned by society and also by the Pharisees. To all purposes, he could be described as one of life's rejects, with little or no use to society. Let us look at this blind man from another view, mainly that of Jesus Christ. Jesus saw this man's worth, he saw that he was made in God's image and likeness and was worth so much. In this blind man's simplicity there was deep faith and belief in God, there was a willingness and an openess to learn the ways of God and there was humility. Had this man been accepted by the Pharisees and given the chance to be a part of their inner circle, there was the risk that he would have learned from them and become like them in attitude therefore rejecting God and making a God of himself, knowing better than anyone else and having power to judge others. When you look at this story and many others like it, one can see that rejection is indeed a blessing as it can protect us from a fate that would take us away from God. It also is a gift that keeps a person humble and causes them to depend on God. Another blessing that comes from rejection is the knowledge that every human being is subject to sin and is not perfect and this causes a soul to cling to God who is perfect and not to judge others. "The stone that the builders rejected has become the corner stone." Jesus is the corner stone who was rejected. No one suffered rejection more than Jesus did. He took the rejection of all of humanity onto himself and endured silently until God's will was done. Who better to follow than Our Lord and Saviour, Jesus Christ. As we continue our Lenten journey, may we bring glory to God by seeing things in a positive way. May we reflect on the many ways Jesus was rejected and come to a better understanding of what rejection is and why it is a necessary part of life. May this understanding teach us to have respect for those whom society rejects and frowns upon and may we come to see each person as a beautiful creation made in the image and likeness of God. Today we thank God for the gift of true happiness. What is this gift of true happiness? Are we ever truly happy in this life? True happiness is found in the presence of God. The desire for God is written in the human heart. Cf. (CCC 27). Saint Augustine said "You have made us for yourself, and our heart is restless until it rests in you." God never intended man to have to suffer. 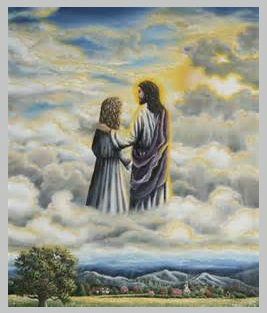 He created man and woman to live in perfect harmony with Him and with each other. cf.(Com. of CCC, 72). Because of original sin human nature is corrupted, is wounded in its natural powers. It is subject to ignorance, to suffering, and to the dominion of death and is inclined towards sin. Cf. (Com. of CCC 78). But despite all this, God's love for us was so strong that he gave us the tools needed to be able to communicate with him, and to overcome our faults and live in joyful peace with him here on earth so that it would be possible for us to be happy in the presence of the Lord where we could come and sing our praises to God. True happiness is not found in material things, that kind of happines is only short lived until something new is needed. St. Teresa of Avila knew true happiness when she said "God alone suffices". How true are her words. In order for God to be enough and to suffice one first of all needs to come to know God. This can be achieved through prayer, through spending time with God in silence and allowing him to enter our lives and fill us with His love. It is this love of God that fills us with true happiness and calls us to live a more true and perfect life in line with the teachings of Jesus Christ. 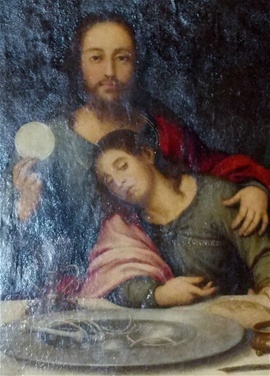 John the beloved disciple, the one who leaned on Jesus' breast at the Last Supper knew this love and it drew him to Jesus. The tools God has given us are prayer and the Sacraments. Through the Sacrament of Baptism, God has made it possible for us to communicate with Him. Through the Sacrament of First Holy Communion we enter more deeply into a communion with Him and then through the Sacrament of Confirmation, the Holy Spirit teaches us and brings us to a much deeper knowledge and understanding of God. God knew our human weakness through sin so he made allowances for this and provided us with the Sacrament of Confession. This Sacrament is an invaluable tool for keeping us in communion with God. This lent let us bring glory to God by spending time with Him alone in the silence of our hearts. May He bring us to a knowledge of the true happiness that lies in love, God Himself who is all love. Today we thank God for the gift of food and water. God in his great goodness provides us with all our daily needs. He gives us our daily bread and water, more than we need. Isn't it wonderful to be able to eat what you want and have plenty and isn't it equally as wonderful to have all the water you need to drink, to wash, clean etc... How often are these basics taken for granted by those who have. God provides mankind with enough for everyone and yet there are so many without these basic necessities. 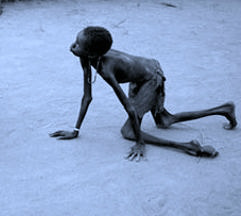 Today, may all who have, remember those who have not and share their bread and water with them. Let us give glory to God in Heaven by remembering how God loves to share with everyone and follow His example by sharing and thinking of others and not just ourselves. Today let us thank God for the gift of the moment. The moment is the best place we could be. To live the moment well is all that is needed. God has breathed his breath into each of us and it is his breath that sustains us every moment of our lives here on earth. So often we are not happy in the current moment we wish to be remembering the past or willing the future. The past is gone and is now just a memory, the future has not come and may never come. The moment, the now is all we have and what a moment it can be. Recognising God in the moment makes that moment all that is needed. To see God and to know that one lives because of Him who sustains us and loves us in the moment is powerful for when God is with us who can be agains't us? As we go about our day, today let us savour the moment and look for God in that moment. May our lives be one's that are lived for God in all the little things in that way not a second is wasted or lost and all Glory and honour will be given to God.